By Inte Gloerich, March 19, 2019 at 3:04 pm . 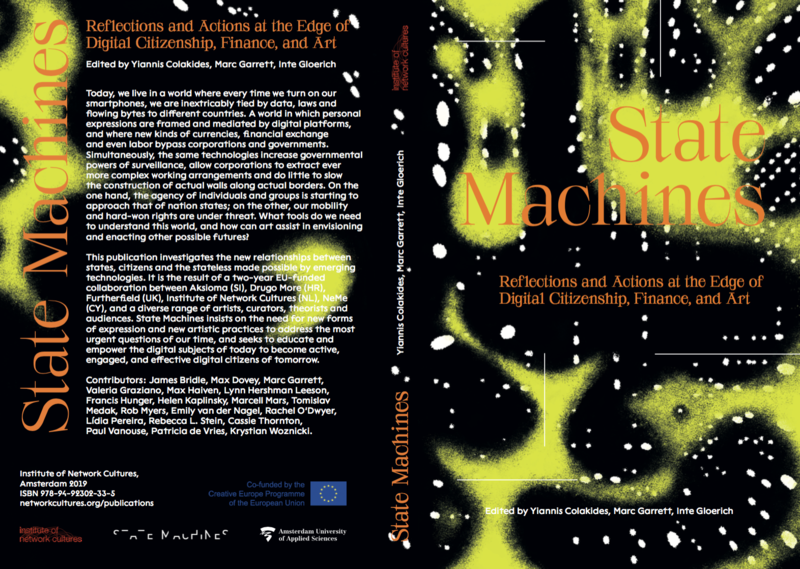 Order your own free copy of State Machines: Reflections and Actions at the Edge of Digital Citizenship, Finance, and Art. About the book: Today, we live in a world where every time we turn on our smartphones, we are inextricably tied by data, laws and flowing bytes to different countries. A world in which personal expressions are framed and mediated by digital platforms, and where new kinds of currencies, financial exchange and even labor bypass corporations and governments. Simultaneously, the same technologies increase governmental powers of surveillance, allow corporations to extract ever more complex working arrangements and do little to slow the construction of actual walls along actual borders. On the one hand, the agency of individuals and groups is starting to approach that of nation states; on the other, our mobility and hard-won rights are under threat. What tools do we need to understand this world, and how can art assist in envisioning and enacting other possible futures? This publication investigates the new relationships between states, citizens and the stateless made possible by emerging technologies. It is the result of a two-year EU-funded collaboration between Aksioma (SI), Drugo More (HR), Furtherfield (UK), Institute of Network Cultures (NL), NeMe (CY), and a diverse range of artists, curators, theorists and audiences. State Machines insists on the need for new forms of expression and new artistic practices to address the most urgent questions of our time, and seeks to educate and empower the digital subjects of today to become active, engaged, and effective digital citizens of tomorrow. Contributors: James Bridle, Max Dovey, Marc Garrett, Valeria Graziano, Max Haiven, Lynn Hershman Leeson, Francis Hunger, Helen Kaplinsky, Marcell Mars, Tomislav Medak, Rob Myers, Emily van der Nagel, Rachel O’Dwyer, Lídia Pereira, Rebecca L. Stein, Cassie Thornton, Paul Vanouse, Patricia de Vries, Krystian Woznicki. This publication is supported by the Amsterdam University of Applied Sciences. This project has been funded with the support from the European Commission. This communication reflects the views only of the authors, and the Commission cannot be held responsible for any use which may be made of the information contained therein. This publication is realized in the framework of State Machines, a joint project by Aksioma (SI), Drugo more (HR), Furtherfield (UK), Institute of Network Cultures (NL) and NeMe (CY).